Remember that 125 job requirement for the full experience? Well, forget about that now. Repackaged into BSA Archive for console port. Decided to offer on Nexus as well. 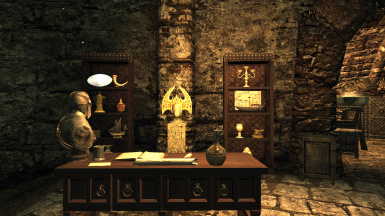 So, hands up if you have honestly ever done the 125 jobs for the Thieves Guild without the use of a mod or some sort of cheat. If you have then I take my hat off to you. Personally, I have never done it, it was just too much to ask so I decided to change that while still being able to play the questline. The following mod is a replacement script that brings the job requirements from 125 down to 25. I have tested this myself by doing 5 jobs each in the major holds in my current playthrough. NOTE: This mod is for a new game, I have heard word in the comments that it doesn't work on an existing game if you've done more than 5 jobs for the Thieves Guild. So, with the changes this is how things work. I'll leave in brackets the old amount. Download main file via "Download with Manager" button. Activate in Nexus Mod Manager. Download files and extract the .7z archive with your tool of choice. Move the folder "Scripts" to your Skyrim Data folder. You may use the content as you please, no permission or notification required.